The "Constitutional Sheriff" movement is based on the idea that local sheriffs are the nation's last line of defense against a runaway federal government that is ignoring the U.S. Constitution, and that is seeking to impose tyrannical controls over the citizenry. Apparently, most of the sheriffs involved have decided that they, rather than the courts, should be the ones who decide what is and what is not constitutional. This link will take you to a video of an Oregon sheriff speaking out against any kind of gun control legislation, and specifically any legislation that would limit the sale of assault weapons and large capacity magazines. 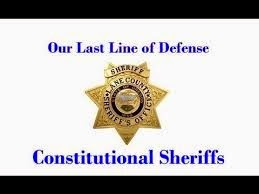 This link will take you to a video of California sheriffs speaking out against federal environmental protection laws, which these sheriffs have determined are unconstitutional, and infringe on God-given property rights. In Santa Cruz County, the "Constitutional Sheriff" doctrine has entered the local political arena, where one of the candidates for County Sheriff apparently espoused the "Constitutional Sheriff" doctrine. According to the "Daily Paul" website, Santa Cruz County Sheriff candidate Roger Wildey is one of the "Oath Keepers" who will stand for the people against their government, as evidenced by his signature on a resolution sponsored by the Constitutional Sheriffs and Peace Officers Association. The "Paul" involved in the Daily Paul website, by the way, is not Paul the Christian apostle, but Ron Paul, a former member of Congress and Presidential candidate whose son, Rand Paul, is apparently running for President on his own account). As it turns out, this "Constitutional Sheriff" concept didn't sell well in Santa Cruz County, where I live, based on yesterday's election results. I think that's probably good. I am, I do confess, more than a bit nervous about overreaching efforts by the federal government to create what Noam Chomsky calls a "surveillance state," putting the rights of ordinary citizens at risk. There is a real problem there, and it would be good for local law enforcement officials to be sensitive to the issues involved. That said, the "Constitutional Sheriff" movement doesn't quite capture the best way to address that potential problem. At least, not in my judgment. The role of the County Sheriff is to enforce County laws, not interpret the United States Constitution, nor even to interpret County laws. It is up to the courts and the legislative bodies to interpret the body of law appropriate to their jurisdictions. County Sheriffs to not have the mandate nor the authority to interpret state or federal law.